Physical characteristics: Rufous-bellied seedsnipes are 10 to 11 inches in length (27 to 30 centimeters) and weigh between 10.6 and 14.1 ounces (300 to 400 grams). The head, neck, back, and breast are barred black, brown, and cream, a pattern that allows individuals to blend in with their environment. The belly is reddish brown or a pink cinnamon in color. Geographic range: Rufous-bellied seedsnipes are found in the Andes of Chile, Argentina, Bolivia, Peru, and Ecuador. They generally occupy high altitudes, of at least 3,300 feet (1,000 meters) in some areas and much higher in other areas. 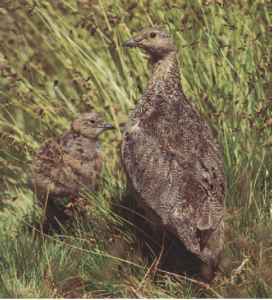 Habitat: Rufous-bellied seedsnipes occupy rocky slopes and alpine bogs. Diet: Rufous-bellied seedsnipes eat the buds and leaf tips of cushion plants found in their habitat. Behavior and reproduction: Rufous-bellied seedsnipes are usually found in pairs or small groups. They make loud calls that are described as cackles. Rufous-bellied seedsnipes are monogamous (muh-NAH-guh-mus), with a single male breeding with a single female. The female lays four eggs at a time into a nest that is usually just a scraped indentation in the ground with little or no lining. When neither parent is incubating, or sitting on, the eggs, they are covered with dirt to help keep them warm and hide them. Rufous-bellied seedsnipes and people: Rufous-bellied seedsnipes are hunted by local populations. Other than that, there is no significant interaction between rufous-bellied seedsnipes and people. Conservation status: Rufous-bellied seedsnipes are not currently considered threatened. 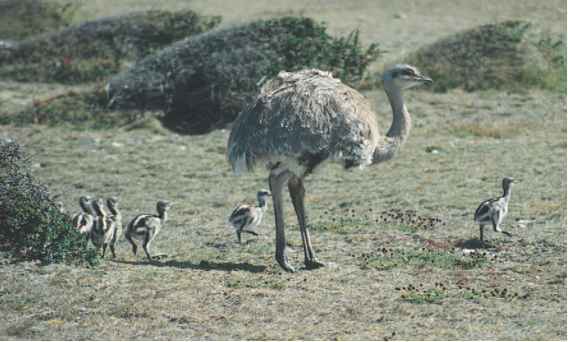 However, because they are hunted near mines in their range, some populations have been drastically reduced in numbers. del Hoyo, J., A. Elliott, and J. Sargatal, eds. Handbook of the Birds of the World. Vol. 3, Hoatzin to Auks. Barcelona: Lynx Edicions, 1996. Fjeldsa, Jon, and Niels Krabbe. Birds of the High Andes. Copenhagen: Zoological Museum, University of Copenhagen, 1990. Perrins, Christopher, ed. Firefly Encyclopedia of Birds. Buffalo, NY: Firefly Books, 2003. "Family Thinocoridae (Seedsnipe)." Animal Diversity Web. http:// animaldiversity.ummz.umich.edu/site/accounts/classification/ Thinocoridae.html#Thinocoridae (accessed on June 1, 2004). "Seedsnipes." Birds of the World, Cornell University. http://www.eeb. cornell.edu/winkler/botw/thinocoridae.html (accessed on June 4, 2004). "Thinocoridae (Seedsnipes)." The Internet Bird Collection. http://www. hbw.com/ibc/phtml/familia.phtml?idFamilia=63 (accessed on June 1, 2004). Sheathbills vary in size from 13.4 to 16.1 inches (34 to 41 centimeters) in length and from 16 to 27 ounces (450 to 760 grams) in weight. They have plump bodies, short legs, and short conical, cone-shaped, bills with a horny sheath covering the upper bill. Sheathbills also have unusual featherless patches on the face covered with wart-like bumps called caruncles (KAR-un-kulz). The rest of the sheathbill body is covered with white feathers. Pale-faced sheathbills have a greenish sheath on the bills and pink caruncles, whereas black-faced sheathbills have black bill sheaths and black caruncles. Males are larger than females in the sheathbills, generally weighing about 15 percent more. Males also have larger bills and larger sheaths. Adult birds have more caruncles on their faces than younger birds. Older birds also have spurs on their wings which they use for defense and in fights. Sheathbills are found along the Antarctic Peninsula, on islands of the subantarctic, and in the southern parts of South America. Sheathbills are found primarily on coastal plains and in coastal wetlands. They are generally found in the vicinity of large seabird colonies. During the nonbreeding season, sheath-bills may be found in meadows, bogs, and ice floes, sometimes as far as 0.6 miles (1 kilometer) inland.